The American border is indefensible and until we recognize and accept this fact we will continue to waste precious resources attempting to accomplish an impossible goal. I am not speaking here only of our Southern border, but also our Western and Eastern sea borders and our Northern border with Canada. Our Southern border is 1,969 miles wide. We have spent billions of taxpayer dollars to build fences along much of the border and billions more to pay government employees to patrol the border. Despite these expenditures, approximately half a million people cross our Southern border illegally every year. 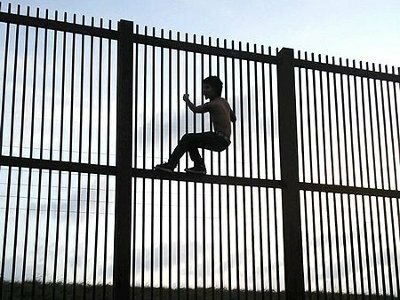 Immigrants currently scale the border fence with ladders, dig under it with ditches and tunnels, and tear it apart with hacksaws and blow torches. They even drive trucks up to the fence and unload cargo over the top of it. We need to face the fact that fencing is useless against human ingenuity. If we were to build and maintain an effective solution for a secure Southern border, it would cost American taxpayers hundreds of billions of dollars every year to maintain — and it still wouldn’t achieve the desired goals. One reason it would fail is that we have three other borders — all of which are far less secure than even our current Southern border. Illegal border crossings would just shift to our other borders. A larger reason it would fail is that 45% of the approximately twelve million illegal immigrants currently in the United States came here legally using visas or border crossing cards. They came here legally and then stayed past the lengths of their authorized visits. Even a truly secure border would do nothing to prevent these occurrences. We should not feel alone here. The Great Wall of China was built upon the deaths of a million Chinese peasants and it ultimately failed to protect the empire. The Maginot Line diverted resources which could have been used for the defense of France to a static line which provided no defense against the German blitzkrieg. The Iron Curtain of the Soviet Union was somewhat effective in preventing the escape of Soviet subjects, but at a debilitating cost to the Soviet empire. If we truly want to stop illegal immigration, we must remove the incentives for people to engage in that activity. By and large this means not granting taxpayer-funded welfare to everyone who applies. If we are able to do that successfully, we will stop attracting immigrants who travel North to take advantage of our government’s largess. We will still, however, attract immigrants who come to the United States seeking to work. Perhaps that isn’t a bad thing. Our nation was founded by immigrants who were willing to work hard to build a better future.